Today we’re giving you a Tokyo Capsule Hotel Tour! For our last night in Tokyo, we booked 2 pods in a super futuristic capsule hotel in the heart of Koreatown. This capsule hotel is called 9 Hours and it is part of a chain of capsule hotels found across Japan, so if you like the look of it, you can experience it across the country! Capsule hotels in Japan used to be male only, and today there are some that are female-only, however, we stayed at one that welcomes both men and women. The only thing to note about staying in a capsule hotel is that there are separate floors for men and women, so if you’re a couple, you’ll be split on different levels. One of our bucket list items in Japan was to spend a night in a capsule hotel. So before leaving Tokyo we booked a night at 9 hours. 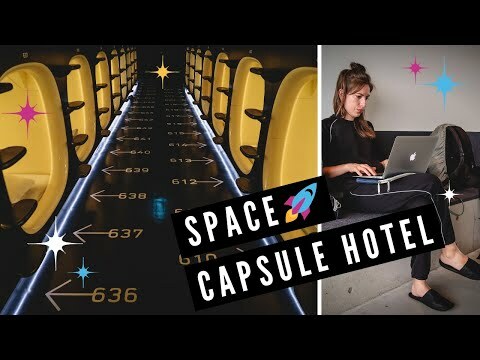 A futuristic capsule hotel that pretty much looks like a spaceship. This pod hotel is located by Shin-Okubo station right in the heart of Korea Town and in this video we’re going to share the whole experience with you guys. We are just waiting for the elevator now. The reception is surprisingly on the 8th floor not the first. The check-in process was simple and straight forward. We were each given a card with a qr code which would act as our key for the duration of our stay. We checked out the views of our neighborhood and also learned that the capsules for men and women are on separate floors. This is the part where Sam and I have to go our separate ways. Different floors for men and women. So I’m on the 6th floor and I’m on the 4th. We’ll each take our own camera and show you are own experience. Indeed. And we’ll meet back here in a bit. I went up to the 6th floor to find my locker and store my belongings. All of the lockers have an overnight kit to make each guest stay at the capsule hotel a little more comfortable. A look inside the bag coming up soon. I also discovered that my suitcase was a little too plump for my locker so some pushing and prodding ensued. And inside I had this little bag already waiting for me. It looks like we have a towel, some slippers and PJs. It looks like we have slippers with the 9 hours logo. We have a towel. We’ve got some pajamas to put on. This is going to be fun. Oh okay toothpaste. Toothbrush. That is our kit for spending the night at a capsule hotel. Let’s actually go check out my capsule. Before going into the dorm with all of the capsules we have to take off our shoes and put on slippers. Even though it was the middle of the afternoon I was ready to explore my pod. First up a little stretch test to see just how much space there is in one of these capsules. Not bad. I definitely didn’t feel claustrophobic in there so that is a good start. It is time for final thoughts on our first and only capsule hotel experience. Yeah. What did you think? How was your night? We were sleeping in different areas. I had a great sleep. I went to be about 11 pm woke up at five and I slept continuously. Overall I would recommend staying in a capsule hotel but I think just for one night. Yes. I don’t think you’d want to be in there for multiple nights. I would agree. I would want to experience it once here in Japan but I don’t need to sleep in a capsule for a week or a month. Book a hotel or an apartment or something else. So yeah that is it for now we’ll see you guys in the next video. Bye.